It’s been a while since the last update, but I’ve been traveling a lot for work and have had little time to work on my guitars. I was able to take a few evenings this week and I finally have completed one - and made a few changes to my others. The exciting news is that all three are fully playable - I may make a few minor changes moving forward, but I’m very happy to be playing them instead of staring at a pile of parts. On the left, the transparent red Pacer C1 body from late 1989 - this body has some unique cutouts, despite sharing the 7/8 sharp-radius shape like the others. It has the recessed floyd cavity and lower horn scoop, but also has beveled scoops on both upper and lower horns on the rear side, similar to a Proaxe body. I’m not sure how it ended up this way - my speculation is that this is the final evolution of Kramer bodies, but based on the serial number this was one of the last ones out the door before bankruptcy so there is not a lot of information about. This guitar was always very brittle sounding, so I removed the JB A2 and put in a PATB-1 Parallel Axis. I thought it would be funny to put the PATB into a guitar with the slanted humbucker mount, and it does sound great. I also wired up a tiny tone pot which sits fully open inside the control cavity to help tame some of the highs associated with having only a single volume knob. The trans red pacer previously had the “claw” neck, which I moved to the FF Red sustainer body in the center. The action on the FF Red sustainer is as perfect as I’ve ever seen, really a fantastic player. This has a TB-4 JBJ that I removed from a ‘94 or so ESP Mirage, and the neck is a regular SH-4 JBJ, set much lower to keep the volume in check. This is a surprisingly great combination, and the JB is really fun in the neck position. The body was NOS, so it did not have holes drilled for pickup rings - so I mounted them directly to the wood since this would be the only opportunity to do so on a body like this. For now, there are only volume/tone and a selector, but I plan on wiring up some type of electronics to make use of the extra holes drilled in the body. The white Sustainer finally has a neck pickup, a Dimarzio PAF Pro which I really enjoy - I think I’m growing to be a big fan of high output neck pickups. The Dirty Fingers in the bridge sounds awesome as always, but to occupy the extra holes in the body, I’ve installed a wah/midboost circuit from GuitarFetish. When it is turned off, I have access to volume, tone, a 3-way selector, and a 3-way coil tap switch towards the neck. The next switch is a two-way, which turns off or on the circuit, and the last switch changes the mode of the circuit, either Wah or Mid-boost. The third knob controls the active electronics - for example, I can preset a cocked wah sound with that knob, leave the effect off while playing rhythm, then flip it on with just the toggle for an instant solo tone, especially useful when covering songs with synth lead parts. Alternatively, I can set a boost amount, then flip on the mid boost with the switch for more gain. It’s a lot of fun, and I may use the same electronics on the FF Red project as well. I’ve wanted a maple fretboard Kramer for a long time, but they are few and far between in the “pointy” era (86-90). After I happened across a nice sustainer body on reverb for too low of a price to pass up, I had visions of a chance to do a graphic finish and a maple board. I lucked out and snagged a fairly beaten maple neck from Craigslist (thanks Joe!). Someone had tried to lacquer the neck and didn’t do the best job, but structurally it is in perfect shape. I personally like lacquered necks as opposed to satin or oil finishes, but this one looks to be lightly brushed on and has a few bumps along the back. I think when I have the time, I’ll do some sanding and apply some more lacquer to smooth it out, then it will be perfect. Since I don’t have the sustainer circuitry, I picked up a GFS Modboard that’s a switchable wah or midboost. I haven’t heard it yet, but with so many free holes for switches I wanted to put something in. 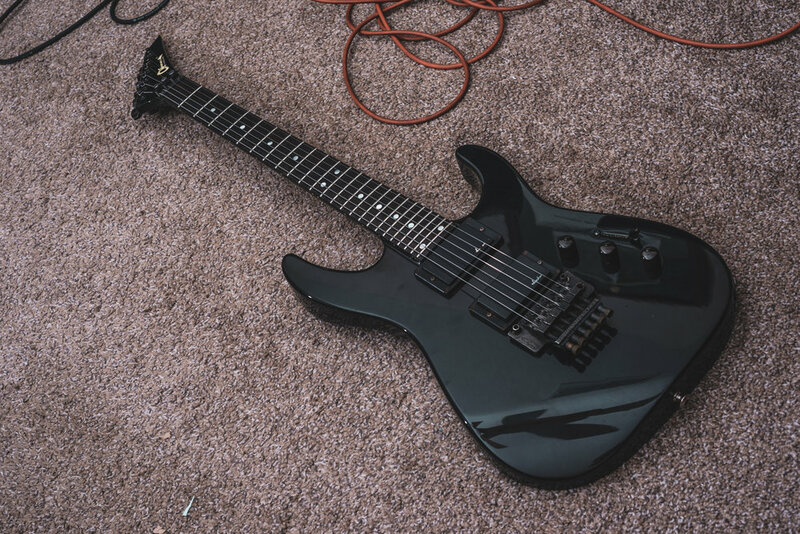 I’m hoping I can get a similar sound to my Charvel Spectrum’s JE-1500. At the moment, the bridge pickup is a Gibson Dirty Fingers, which I’ve never had before - and it sounds fantastic. My neck pickup is eventually going to be a Dimarzio PAF Pro, but the one I bought used has larger holes than I have screws for right now so I just left it empty for now. Stay tuned as I add the rest of the parts and get to work on the finish. Really excited about how this is going to turn out!